Bright Star is a 2009 British-French-Australian biographical fiction romantic drama film based on the last three years of the life of poet John Keats and his romantic relationship with Fanny Brawne. It stars Ben Whishaw as Keats and Abbie Cornish as Fanny. It was directed by Jane Campion, who wrote the screenplay inspired by Andrew Motion's biography of Keats; Motion served as a script consultant on the film. The film was in the main competition at the 62nd Cannes Film Festival, and was first shown to the public on 15 May 2009. The film's title is a reference to a sonnet by Keats titled "Bright star, would I were steadfast as thou art", which he wrote while he was with Brawne. In 1818 Hampstead, the fashionable Fanny Brawne (Abbie Cornish) is introduced to poet John Keats (Ben Whishaw) through the Dilke family. The Dilkes occupy one half of a double house, with Charles Brown (Paul Schneider)—Keats' friend, roommate, and associate in writing—occupying the other half. Though Fanny's flirtatious personality contrasts with Keats' notably more aloof nature, she begins to pursue him after she has her siblings, Samuel and Toots, obtain his book of poetry "Endymion". Her efforts to interact with the poet are fruitless until he witnesses her grief for the loss of his brother, Tom. While spending Christmas with the Brawne family, Keats begins to open up to Fanny's advances. Keats begins to give poetry lessons to Fanny, and it becomes apparent that their attraction is mutual. Fanny is nevertheless troubled by Keats' reluctance to pursue her, for which her mother (Kerry Fox) surmises, "Mr Keats knows he cannot like you, he has no living and no income." It is only after Fanny receives a valentine from Brown that Keats passionately confronts them and asks if they are lovers. Brown, who sent the valentine in jest, warns Keats that Fanny is a mere flirt playing a game. Fanny, hurt by Brown's accusations and by Keats' lack of faith in her, ends their lessons and leaves. It is not until after the Dilkes move to Westminster that spring, leaving the Brawne family their half of the house and six months rent, that Fanny and Keats resume their interaction and fall deeply in love. The relationship comes to an abrupt end when Brown departs with Keats for his summer rental, where Keats may earn some money. Though Fanny is heartbroken, she is comforted by Keats' love letters. When the men return in the autumn, Fanny's mother voices her concern that Fanny's attachment to the poet will hinder her from being courted. Fanny and Keats secretly become engaged. Keats contracts tuberculosis the following winter. He spends several weeks recovering until spring. His friends collect funds so that he may spend the next winter in Italy, where the climate is warmer. After impregnating a maid, Brown is unable to accompany Keats. Keats manages to find residence in London for the summer, but he is taken in by the Brawne family following an attack of his illness. When his book sells with moderate success, Fanny's mother gives Keats her blessing to marry Fanny once he returns from Italy. The night before he leaves, he and Fanny say their tearful goodbyes in privacy. Keats dies in Italy the following February of complications from his illness, just as his brother Tom did earlier in the film. In the last moments of the film Fanny cuts her hair in an act of mourning, dons black attire, and walks the snowy paths outside that Keats had walked many times in life. It is there that she recites the love sonnet he had written for her, "Bright Star", as she grieves the death of her lover. Ben Whishaw as John Keats. 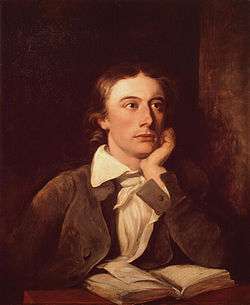 Keats was one of the key figures in the second generation of the Romantic movement despite the fact that his work had been in publication for only four years before his death. During his lifetime his poems were not generally well received by critics and at age 25 he died believing he was a failure. However, his reputation grew and he held significant posthumous influence on many later poets. Abbie Cornish as Fanny Brawne. Like the real life Fanny Brawne, Fanny in the film is a fiery and fashionable eighteen-year-old who spends her time creating dresses, hats, and various other garments. She is also something of a flirt and enjoys attending balls, inducing jealousy in Keats. Though the real life Fanny Brawne went on to marry and have children, she never sold Keats's love letters.They were sold after her death by her children. Paul Schneider as Charles Armitage Brown, Keats' best friend. Kerry Fox as Fanny's mother, a widow. Thomas Sangster as Samuel Brawne, Fanny's younger brother. Edie Martin as Toots, Fanny's younger sister. Antonia Campbell-Hughes as Abigail O'Donaghue Brown, housemaid and mother of Charles Brown's child. In addition to "Bright Star" several other poems are recited in the film, including "La Belle Dame sans Merci" and "Ode to a Nightingale". Both Campion and Whishaw completed extensive research in preparation for the film. Many of the lines in the script are taken directly from Keats' letters. Whishaw, as well, learned how to write with a quill and ink during filming. The letters that Fanny Brawne receives from Keats in the film were actually written by Whishaw in his own hand. Janet Patterson, who has worked with Campion for over 20 years, served as both costume designer and production designer for the film. The Hyde House and Estate in Hyde, Bedfordshire, substituted for the Keats House in Hampstead. Campion decided that the Keats House (also known as Wentworth Place) was too small and "a little bit fusty". Some filming also took place at Elstree Studios. The film did not go unnoticed in the poetry world. Poet and scholar Stanley Plumly, the author of Posthumous Keats: A Personal Biography (W.W. Norton, 2008), wrote of the film's writing and direction: "Jane Campion has understood the richly figurative in Keats’ life without sacrificing the literal wealth of its texture. She has evoked the mystery of his genius without giving up the reality of its dailiness. ... Love, the poems, and Keats’s poorly diagnosed yet terminal illness all move in parallel, though in Campion’s film it is love — made brighter by the intensity of mortality — that defines her subject. But even passion here is understated, as it must have been in real life — given the conventions — for these two intense individuals. The much-reviewed scene in which the would-be lovers, in a bedroom, are speaking back and forth lines from Keats’s newly composed ballad 'La Belle Dame…' surely qualifies as flesh-made-word love-making. The scene gorgeously represents what poetry as well as love are about — the spiritual inseparable from the carnal." Bright Star grossed $3,110,560 at the box office in Australia. Lakeshore Records released the soundtrack for Bright Star digitally (iTunes and Amazon Digital) on 15 September 2009 and in stores on 13 October 2009. The film's soundtrack features original music by Mark Bradshaw with dialogue from the film voiced by Cornish and Whishaw. Composer Mark Bradshaw can be seen in the film as the conductor while the men choir performs the track Human Orchestra composed by Bradshaw himself. It's on set that actor Ben Whishaw who plays John Keats and Mark Bradshaw met. Since the shooting, they are a couple. ↑ Michael Phillips, "Talking Pictures" on chicagotribune.com. Retrieved 9 November 2009. ↑ movies.yahoo.com Archived 27 July 2009 at the Wayback Machine.. Retrieved 9 November 2009. ↑ "Festival de Cannes: Bright Star". festival-cannes.com. Retrieved 9 May 2009. ↑ McElheny, Meghan. "Five minutes with Bright Star costume designer Janet Patterson: Editors' Blog". Wmagazine.com. Retrieved 8 September 2010. ↑ Anita Singh (15 May 2009). "Cannes 2009: film charts John Keats' romance with Fanny Brawne – in Luton". The Daily Telegraph. Retrieved 15 May 2009. ↑ "Elstree Studios – Film and TV Search Bright Star". Elstreefilmstudios.co.uk. Retrieved 8 September 2010. ↑ Bright Star. Rotten Tomatoes. Flixter. Retrieved 2 July 2012. ↑ Colbert, Mary; Mathieson, Craig. "Bright Star (review)". SBS. Retrieved 14 February 2013. ↑ "Bright Star Soundtrack". Fanbolt.Com. Retrieved 8 September 2010. ↑ "Bright Star Soundtrack CD". Cduniverse.com. Retrieved 8 September 2010. ↑ "Bright Star – John Keats – Penguin Group (USA)". Us.penguingroup.com. 16 September 2009. Retrieved 8 September 2010.